Carol fans, rejoice! 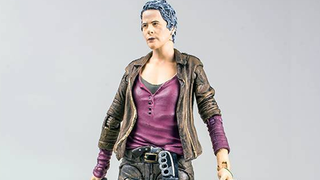 Perhaps the TV show's best character (not the best TWD character as a whole though, she already has one) is finally, finally making her début in McFarlane's action figure line. Despite her not having any weaponry int he above picture, Carol actually comes with a pistol as well as her trusty knife. The wave of figures, which retail for around $15, is in stores now - so you don't have to wait long for your very own Carol Peletier. Hurrah! It's been quite the week for action figures based on characters named Carol, hasn't it?